Steel is still considered as crucial materials in even for the future. 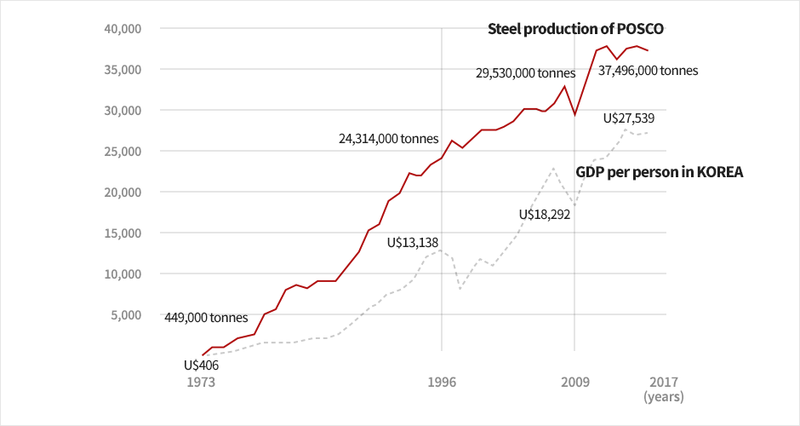 It is estimated that steel consumption will be increasing due to rapid growth of Asian economy. The World Steel Association also announced positive prediction in global steel consumption in 2018. 2018 is also special year for POSCO, world leading steel company since its 50th anniversary. At the celebration, CEO Ohjoon, Kwon demonstrated the missions and visions for preparing future and looked back the past history of POSCO and impact on Korean society. Dream comes true in 2068 achieving 500 billion sales? POSCO has celebrated 50th year anniversary ‘Future vision declaration’ on April, 1st and announced future missions and visions as Top 5 world leading global steel company. Ohjoon Kwon the CEO of POSCO disclosed POSCO’s new future slogan ‘Unlimit the Limit: Steel and Beyond’ by using TED speech method that is currently considered as one of the most efficient speech method. The mission that has been made based on POSCO’s challenges for 50 years history, is expressed the will of POSCO to ‘overcome the limit and go further to the next step’ especially challenging to non-steel industry. POSCO is developing a plan to shift gradually from current profit system that 80% of income from steel industry to new profit system that produces profit from 3 different industrial fields: Steel, Infrastructure, New Growth in the ratio of 4:4:2. By successfully operating new profit system, POSCO expects that the mission can be accomplished by 2068 sales up to 500 billion dollars and 70 billon dollars of operating profit. POSCO’s future vision also has been announced as ‘POSCO the Great’. This was the slogan that Ohjoon Kwon introduced as he had been elected as CEO of POSCO in 2014. The slogan was focused on simply recovering the strength. However, the new slogan is ‘Great Business, Great Technology and Great Culture’ indicating well-organized business structure, advanced technology and organizational culture. POSCO has contributed significant impact on both Korean country and society in terms of steel and educational support. And POSCO has decided to keep supporting business for the country. One of the plans that POSCO is contemplating, is establishment of the place for developing creativity for adolescent. The ’Youth Creativity Center’(tentative) is going to be designed to provide various opportunities to adolescents such as giving experience to understand basic understanding of scientific technology and opportunity to improve creativity. Furthermore, the ‘Youth Creativity Center’ will contain diverse spaces for culture and arts so all generations will be easy to access. POSCO is expecting the Youth center may be a competitive candidate on coming international contests. Seoul POSCO center has opened a new product exhibition hall to communicate more with general populations and show their future vision. The exhibition hall has 30 seats visual promotion room. The room provides POSCO promotion videos and visualized POSCO images by 3D technique. Various animations and techniques are prepared to describe steels that are being used in our life and industrial demands of steel for future. For celebrating 50th anniversary, POSCO will broadcast TV commercial named ’50 years challenge, New Dreams for next 100 years’ until June 10th and POSCO exhibition (Homage to POSCO) will be held in POSCO art gallery in lower ground level until May 8th. POSCO historical museum in Pohang is also going to open gallery (‘Visualized history of POSCO for half century’) showing numerous events during POSCO’s 50 years until June 30th. POSCO is also preparing the event that gives valuable opportunities to share thoughts between CEO and employees in Seoul, Po hang, Kwang yang city. 50 years of POSCO’s history is in the same line with Korean history which means that POSCO has been increasing growth for half century. POSCO was established in 1968, and the very first steel was manufactured in 1973. Since that year, total sales of POSCO has incredibly elevated by 686 times last year from 1973. Growth of POSCO gave great influence on major industry in Korea. Especially Korean automobile and shipbuilding industry had similar growth curve which means that materials manufactured from POSCO was true backbone for those industries. For instance, Korean ship manufacturing has reached to 23.5 million tons from 12 thousand tones from 1973. And automobile production also increased 4.11 million from 25 thousand cars. SEE ALSO: What are Automobiles Made of? Technology is another fundamental aspect of POSCO’s strength. POSCO has developed eco&efficient furnace by its own technology called ‘FINEX’ technology which fully satisfied current and future global trends, environmental and innovative. With this advanced technology, POSCO has exported its unique iron making technique in China in 2013. This describes that POSCO is global technology provider. In addition, POSCO is the global top company that produces steel for vehicles. Approximately 9 million tons of steel for vehicle has been produced from POSCO which indicates that 25% of steel for car manufacturing is from POSCO. Simply 1 in 10 cars in global, uses steel from POSCO. POSCO has established its own smart platform named ‘PosFrame’ that made POSCO is global leading steel company for smartization. With all these achievements, POSCO has been listed in ‘worlds most competitive steel maker’by World Steel Dynamics for 8 consecutive years since 2010. Also POSCO has been top ranked in SAM-Dow Jones Sustainability index since 2005.